This past Saturday we decided to visit historic St. Augustine for the day. We've been to St. Aug many times before, but this was the first time we've visited since our move to Gainesville. The drive took us about two hours each way, and was quite different than the smooth all interstate ride from Tampa (I realize we were pretty spoiled). I had read nothing but positive reviews about O'Steen's Restaurant and its fried shrimp so O'Steen's it was for a late lunch when we got into town. Now, I knew O'Steen's was popular, but I still didn't think there would be much of a wait at 2:30pm on a Saturday afternoon. Boy, was I wrong. We put our name on a list at the window and then waited outside of the small restaurant for 40 minutes until a table opened up. I generally hate waiting in lines, but I'm a sucker for good seafood and was curious what all the fuss was about. Traci was a good sport and positive comments about O'Steen's chicken fingers had her attention. Once seated, our server greeted us and we quickly got down to business. This is a place where you get the feeling there aren't many first-time customers and most folks already know what they want. I ordered a fried shrimp plate of course and Traci went with chicken fingers. Each meal comes with two sides from a fairly long list of choices that reminded me of the lengthy selection of sides at Hickory Hollow in Ellenton. I decided on macaroni salad and coleslaw and Traci decided on fries and fresh fruit. I was somewhat skeptical that O'Steen's shrimp would really be as good as all the rave reviews, but they didn't disappoint. This place isn't just selling nostalgia. The fried shrimp really are some of the best I've had- nice and plump, lightly battered, not greasy - it just doesn't get much better - except when you either dip them in the pink sauce that comes with the shrimp or the datil pepper sauce at the table. Traci gave a thumb's-up to her chicken fingers and my macaroni salad and coleslaw were both solid. Only Traci's fries were disappointing. I'd guess that the sides overall are nothing to write home about. 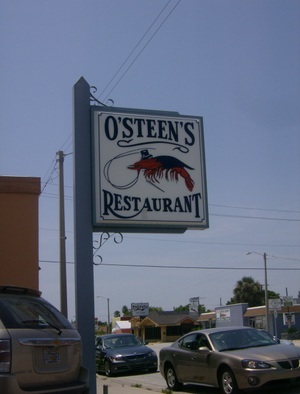 The main attraction at O'Steen's is clearly the fried seafood. I suspect the fried oysters, if done in the same batter as the fried shrimp, are also a thing of beauty. Prices are reasonable and service is solid. For being an obvious tourist destination, O'Steen's has done a nice job in my view of not letting the place get a cheesy, touristy feel to it. The focus is still on the food. O'Steen's is also cash-only so come prepared. Other restaurants in the St. Aug area that we've enjoyed on previous visits include Salt Water Cowboy's and Cap's On the Water. We've also enjoyed drinks and music at the Milltop Tavern. Bottom-line: I don't know the secret for "avoiding the lines" because we tried going during an off-time, but if you're up for the wait, the fried shrimp at O'Steen's are quite a reward for your patience. You can also agree to sit up at the counter when a spot opens up, which almost might shorten your wait.